Meet Your Neighbor Larry Moreland of Lomax. Larry is retired from Heatilator in Mt. Pleasant, Iowa and previously was employed by Conifer for 10 years in Burlington, Iowa. He has also substitute taught at the Dallas City schools. Larry was born in St. Petersburg, Florida and raised in Grant County, Indiana. He graduated from Marion Senior High School in Marion, Indiana and received his bachelors degree from Columbia College in Columbia, Missouri. His parents, both deceased, are Laurence and Florene Moreland. Larry has been married to Peggy for 27 years and Peggy is retired. Two sisters are Ramona (Kenneth) Flanigan of Marion, Indiana and Marjorie (Jim) Schroll of Gas City, Indiana. Heather (Tim) Root of Lakemoor. Heather is a homemaker and Tim is an IT specialist. Jon (Tina) Riley live in Stronghurst where Jon is employed at DC Cooper and Tina is employed at Hy-Vee in Burlington, Iowa. Christina (Joel) Ramirez live in Elgin. Christina is a Pre-K teacher and Joel is employed by Verizon. Tamara Haecker lives in Racine, Wisconsin and is a document technician. They have 7 grandchildren, Evan Root, Justin Duffy, Jordan Ramirez, Abigail Ramirez, Mike and Nicholas Burkey and Christopher Rymer. They are also blessed with 2 great-grandchildren, Hunter and Zachary Burkey. Larry attends Bethel Lutheran Church in Stronghurst where he is on the maintenance committee and has many projects that he helps with. He is active in amateur radio (WBGSVE) and serves as a certified and trained, volunteer examiner and sky warn weather watcher. He also enjoys open-fire cooking which he does for several different organizations such as the Republican Dinner at Delabar State Park, wedding parties, church dinners and any large gathering. Larry and Peggy are avid campers and have their own travel trailer. He owns his own consulting business "Ambient Controls LLC" where he is a specialist at designing and building electrical control systems. 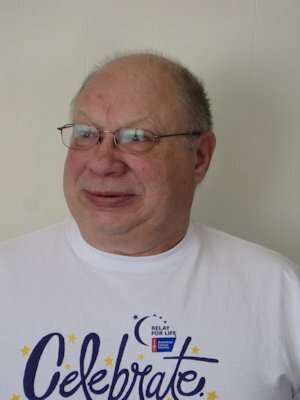 He is a member of the Stronghurst American Legion, WFRT-an amateur radio club in Ft. Madison, Iowa and is involved in the Henderson County Relay for Life. When asked what he enjoyed about retirement he replied, "I am independent and do what I what, when I want, if I want!" A memorable vacation was one they took on their 25th wedding anniversary. It was a scenic train ride through Canada. The name of the trip was the Rocky Mountaineer which lasted 9 days. Another vacation was one they traveled to Yellowstone National Park with two of their children in their camper. Several years ago they rented a houseboat with Larry's sister and brother-in-law and his parents and enjoyed Kentucky Lake.